My Black Friday and Cyber Monday FREE Shipping on jewelry has been such a success that I have decided to extend it! Just use coupon code JEWELSHIP for your purchase at Alyssabeths. 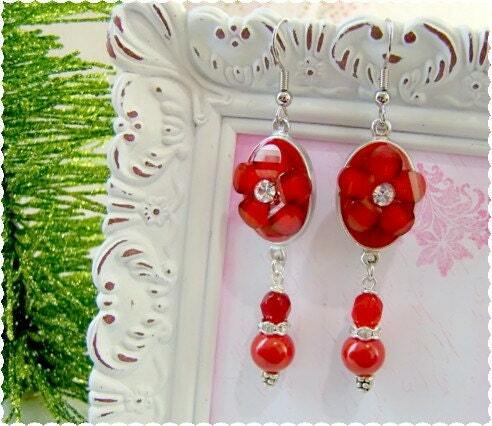 Holiday sparkle ruby red earrings featuring repurposed vintage red enamel connectors decorated with red Lucite flowers with clear rhinestone centers, a dangle of vintage red milk glass beads, silver set rhinestone spacers and garnet red Czech glass faceted beads. 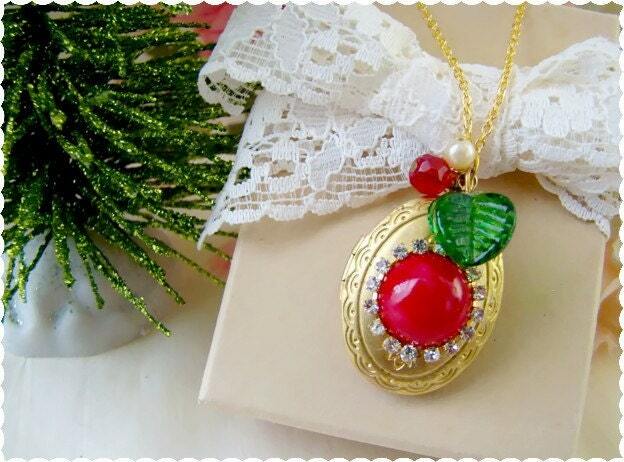 Christmas Cheer Sparkle Locket. Elegant, bright and cheery Christmas Sparkle Locket featuring a lovely oval brass locket adorned with a repurposed vintage ruby red round glass cabochon framed by bright clear rhinestones. Locket is adorned with charms created with a vintage emerald green glass leaf, tiny ivory pearl & ruby red faceted Czech glass bead. 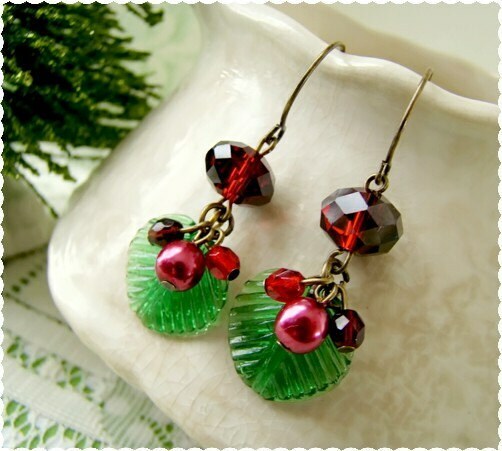 Vintage Chic Christmas Holly Berry Earrings. Festive and elegant, vintage styled Christmas Holly Berry earrings crafted withrepurposed vintage emerald green glass leaf beads, dangles of cherry and burgundy red glass pearls and tiny faceted Czech glass beads, all suspended from claret red faceted Czech glass oval beads. 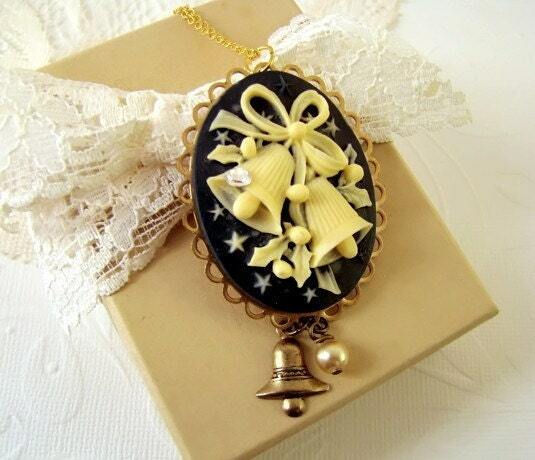 Vintage Chic Christmas Bell Cameo Rhinestone Charm Necklace A very chic, vintage style Navy & Cream Christmas Bell Cameo Pendant Necklace. This lovely and elegant necklace features a large Christmas Bell cameo accented with a crystal rhinestone set in antique brass lace edge setting accented with a little vintage antique brass bell charm and a taupe ivory pearl drop. These are SO pretty.. I have to sneak around and Merry Christmas SUPRISE myself : )) lol..